Describe the properties of a solid. Describe the properties of a liquid. Describe the properties of a gas. How does the temperature affect solids? How does the temperature affect liquids? What is meant by changes of state? 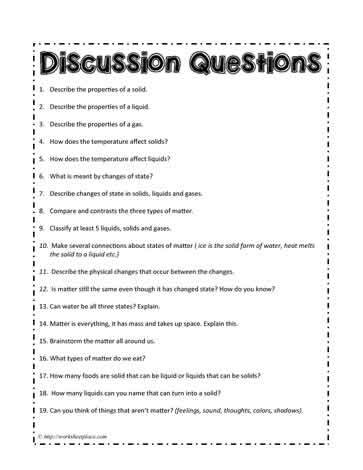 Describe changes of state in solids, liquids and gases. Compare and contrasts the three types of matter. Classify at least 5 liquids, solids and gases. Describe the physical changes that occur between the changes. Is matter still the same even though it has changed state? How do you know? Can water be all three states? Explain. Matter is everything, it has mass and takes up space. Explain this.